We stayed in Chiang Mai for a little over a week - mostly lounging around but we spent a lovely day with elephants, I took a cooking course and we popped into town every so often to the excellent Mexican restaurant we found, which was conveniently next door to a delicious burger bar. Staying on the edge of town had its drawbacks - it cost 100 baht each way when we wanted to go into town. We did try to walk once, but only once, having to cross the Superhighway and then the busy moat road and several other busy roads - pedestrian crossings there seem to consist mostly of a faded zebra stripe that everybody ignores, and you can wait a good 10 minutes before it's safe to cross. However, we were glad to stay where we did - our hotel was situated in quite a green and leafy neighbourhood, no touristy pretences, just real people going about their real lives, and restaurants full of Thai people in which very little concession was made to the western world. One restaurant made our curries so hot we could barely eat them - and we are people who order especially hot sauce off the internet and can't usually convince restaurants in England to actually make something hot enough. We found a lovely street restaurant with an extensive menu in Thai and a few pictures with English pronunciations. The food was delicious and fried but also full of tasty crunchy vegetables, and we could both eat there, with drinks, for about 80 baht (£1.60). We also ate in a non-Thai restaurant which was pretty pricey compared to others nearby but we had a good meal there - I had crab pasta and Dgym had a duck curry, followed by some lovely cakes. However, not such a good experience when we returned to try some of their cheaper Thai dishes. My pork fried rice had a funny smell and taste which I soon identified as somewhat dogfoody - Dgym concurred, and suggested that they might have used bone marrow. I didn't finish that meal. There were also some small convenience stores along the road, selling a selection of weird little cakes, snacks and drinks. 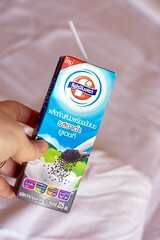 I became quite addicted to black sesame flavoured soy milk. Dgym drank too much of the chocolate flavour milk and got tummy ache. I spotted blueberry and hazelnut flavoured Pringles in the shop one time but they had disappeared again by the time I had made up my mind to try them, which is not necessarily a bad thing. We were headed to Phuket next for some beach action, from the top of the country to the bottom - and decided to fly down to save ourselves two consecutive nights on sleeper trains. Much as I prefer overland travel to flying, I will concede that it saved us a hell of a lot of hassle this time. 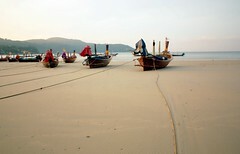 We took the minibus from Phuket to Kata beach where our hotel was waiting for us. They turfed us out of the bus half way and into a travel agent where we saw our first fake-looking smiles since we got here as the travel agent lady enquired about our plans with the aim of selling us a hotel. We dutifully answered the questions, expressing our disinterest in being sold anything, and got back on the minibus where it continued its journey. The minibus costs half the price of a taxi and drops you right outside the hotel so we're not complaining too much if that helps to keep it cheap. On arrival at Kata we were super hungry so dumped our stuff and went out to eat, instantly finding that everything was super expensive compared to Chiang Mai and even Bangkok. Being desperate to eat, we picked a restaurant and ordered some relatively cheap Thai dishes (A simple fried rice or Pad Thai seems to go for about 120 baht here). They were absolutely horrible, the worst food we've had in Thailand so far, and were served with "juice" that was not juice but sugared stuff from a carton. 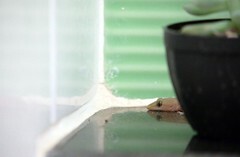 My noodles were overflavoured and so rubbery they pinged me in the eye, and Dgym's rice had no flavour at all. Then it started bucketing down with rain. We popped into a mini mart afterwards and I was slightly cheered up by finding some weird banana flavoured crisps. It's our third day in Kata now and we've found some actual decent food (including pizza, which made Dgym happy) and real fruit juice but it's still bleeding expensive compared to anywhere else we've been here and we feel ever so slightly caught in a tourist trap. It's very very different here. People are constantly trying to sell you stuff, be it ladies in street bars trying to sell themselves or the crazy bloke at the Indian restaurant whose arms never seem to tire from trying to wave people in from the other side of the street. Or the tailors who step in front of you and try to shake your hand as you walk past their shop. Walk up to a menu outside a restaurant and the waiter will come out and hover over you until you either walk away or decide to go in. Maybe they have had problems with people stealing menus from outside restaurants. It all comes across as a bit pushy and we're not quite sure how to take it. It feels as if people are trying to aggressively sell you stuff all the time, but maybe we're wrong and it's just the nature of people in this region to greet everybody that way. Either way, we're still trying to find where the Thais eat, those restaurants that aren't filled with tourists and where perhaps we have to point at a picture to order. Needless to say we have been spending some time at the beach - the northern and slightly sewagey smelling end is quite empty but the rest is jam packed with loungers and umbrellas as far as the eye can see - they go for 200 baht a day which the sellers don't seem to want to negotiate on, but we're quite happy sitting on a towel under a tree next to dozens of empty seats which are doubtless costing them money - just a little willingness on their part to haggle would see them making a bit more of it back, but never mind. I'm surprised the numerous beach sellers still bother to approach us given that we're clearly too cheap to even fork out for a seat. The sand's lovely and soft and the sea's lovely and warm and a little bit wavey at times and it's good to go for a swim in mid December. It's not all bad. Despite the cheap and cheerful side of Thailand being slightly absent here, there are some things that shine through all the touristy crap - the huge and brightly coloured butterflies, the chorus of noisy frogs outside our window at night, the mummy gecko and its tiny baby that we found on one of the hotel walls... and the lovely pancake lady who sets up her cart at the end of the road. 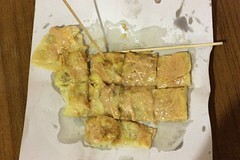 Thai pancakes (roti) are a bit different from the European kind - they begin life as a solid ball of dough made from flour, egg and coconut butter, which is kneaded and beaten into a flat pancake shape before being fried and folded over any filling you may care to order in a neat little pancakey parcel. Definitely tastes different too, a bit more like a flatbread than a pancake, but delicious.